Proxima is more than a bit of a surprise. There is no doubt that Stephen Baxter is a talented and imaginative author and has worked with some of the finest people to put pen to paper however I find some of his novels quite dry and lacking in empathy / effective characterisation. To be fair though part of this is due to the subject matter some of his works draw from, often narrating a timeline that encompasses thousands of years or span vast events. As a result it would be pretty much impossible to have one group of central characters throughout. Proxima has all of his wonderful imagination and yet is also much more focused and far easier to read than any of his books I've read before (including the Long Earth novels). The book is pretty much irresistible right from the word go, drawing you into the story and making you gasp at the sheer scope. If you imagined combining the gritty and realistic nature of Allen Steele's interstellar settlement "Coyote" series with the imagination of Phillip Mann's "The Disestablishment of Paradise" and focused into a dynamic and multi-layered story then you might be some way to imagining what Baxter has accomplished here. It is quite simply breath-taking and has elevated my opinion of the author tenfold. So what's so special about the book? For a start the story constantly surprises and moves forward without pause or break. Then there is the incredible imagination, from the futuristic space ships powered by otherworldly energy sources - not to mention a completely different type of space ship - to the description of the alien life which is reassuringly alien and yet somehow seems highly plausible at the same time. These descriptions are on a par with the best depictions of alien life I've had the fortune of reading about. Then we have what I can only describe as "Arthur C Clarke" moments - the "my god it's full of stars" jaw-dropping feeling that hits you on a number of occasions through the book. There are very few novels that can you lead you back to that more innocent age before the relentless onslaught of modern technology. That feeling of things being so far advanced, so alien that we simply can't understand them, all adding to the rich story. There are so many great ideas here, not least the way that Promixa is populated (which took me by surprise) along with the way that these reluctant pioneers survive, but also much closer to home too. Just what are these energy "kernels" and who left them for us to discover. The book takes some pretty unexpected turns which includes a spectacular, if somewhat bittersweet and pretty shocking ending. 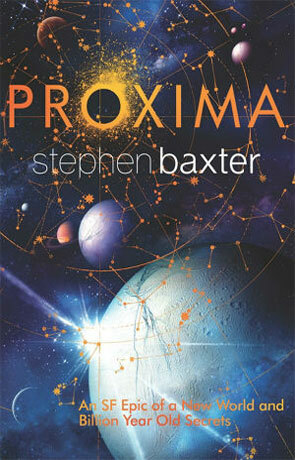 Promixa is not only the finest Baxter novel to date but also stands a seriously impressive read. Simply magnificent. Written on 8th November 2013 by Ant.